Protein can be hard to come by with my diet, because I don't eat a ton of meat (this just happens, not because I'm a vegetarian or anything). I met with an exercise physiologist in the fall who told me I should eat one gram of protein per kilogram of weight. I was already trying to reach 100 grams of protein per day, so his formula was a bit more achievable to me. I already love my chocolate protein muffin recipe, but I saw this recipe on Pinterest and couldn't wait to try it. Instead of microwaving, like with the chocolate recipe, the banana recipe is baked like regular muffins, so it was easy to make a week worth of healthy snacks quickly. Better yet, these fit comfortably in a half-cup plastic container, so they're portable. They're roughly 60 calories per cupcake and about 8 grams of protein. Whisk together the banana, egg whites and fage. Mix the protein powder, Splenda, baking powder, baking soda and cinnamon together, then add to the wet ingredients and mix well to combine. Scoop evenly into a well-oiled nonstick muffin pan. Bake at 350 degrees for 15 minutes or until the tops are golden brown. 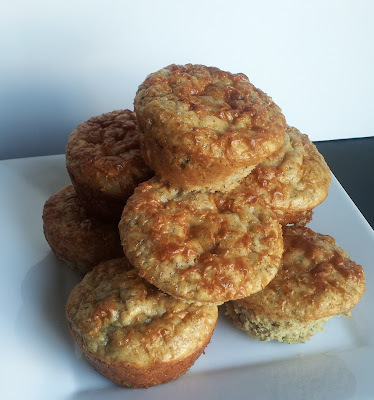 Allow to cool for about five minutes, then use a butter knife to free the edges of the muffins from the muffin tin. Move to a cooling rack and allow to completely cool. These are best served warm and they're great plain, but I've tried them with just a dab of peanut butter or some no sugar added applesauce, both of which are good options, too.